Albany Indian Mounds State Historic Site in Albany, Illinois consists of 205 acres of tree covered hills, valleys and surrounding prairie which is ideal for a walk, bike ride or just sitting and observing the wildlife from deer to eagles that call the park home. The Indian Mounds is now an Illinois State Historic Site. Laying neglected for hundreds of years it is now a natural park open for the public. 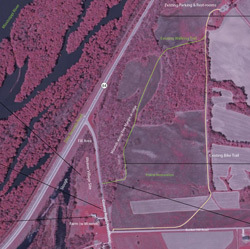 The Albany Indian Mounds Foundation sees the site as an interpretive center for the history of the Hopewellian culture of more than 2000 years ago. Located at the south end of the village, there is a parking lot at the entrance, at the southwest end of Cherry Street. Nearby is a covered picnic shelter with tables and electricity outlets, water fountain, rest rooms and interpretive signs. The parking lot is also the north entrance of the asphalt-covered Great River Recreation Trail. Here the trail runs for nearly a mile to the south to Bunker Hill and Meredosia roads. Across Meredosia Road to the south is another 15 acres that once was a village site owned by the Illinois Historic Preservation Agency. The Indians who lived here as early as 500 BC were part of the Hopewell culture, so named because of their existence was first learned of on the Hopewell farm in Ohio where similar mounds had been built. It is not known what the people called themselves or what language they spoke. It is believed that their culture seemed to decline somewhere about 350 A D.
The site was well suited to the Hopewell culture, which was not an Indian tribe, but rather a term referring to the period of time in American Indian prehistory marked by trade, communication and a sharing of ideas throughout a very large area of the continent. They preferred to build their villages at the base of bluffs along the floodplains of major rivers, such as the Mississippi, that offered transportation. At Albany, with the adjacent Meredosia Slough which served as flood drainage for the Mississippi and Rock rivers, there was an abundant source of food and water. 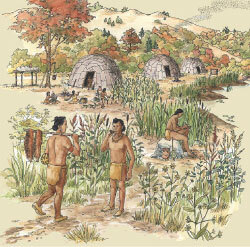 The waters, forest and prairie provided food and fuel for the Hopewell.